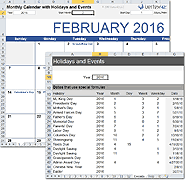 Download a free yearly calendar for Microsoft Excel® that displays Moon phases. 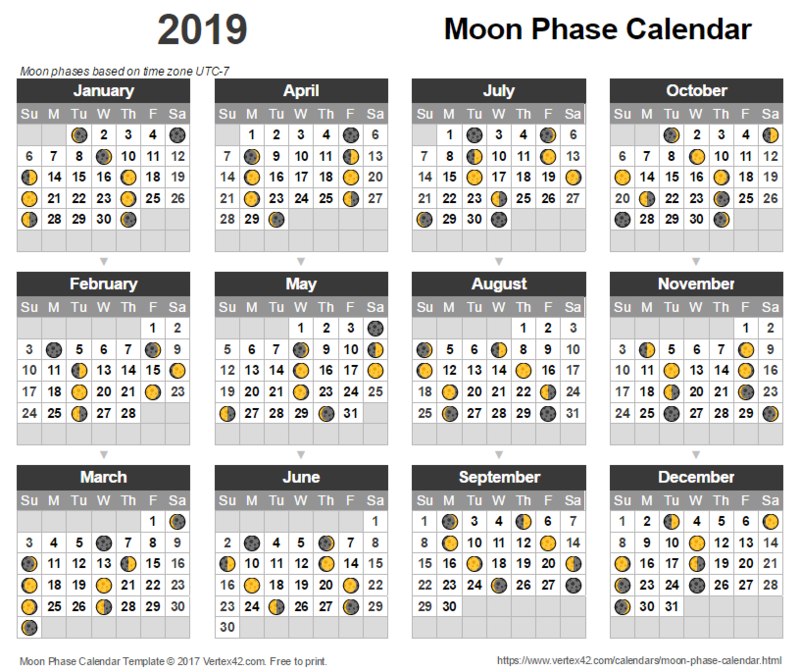 The calendar templates on this page use a table of Moon phase times* to display the Full Moon, New Moon, and the other major phases in yearly or monthly calendar formats. 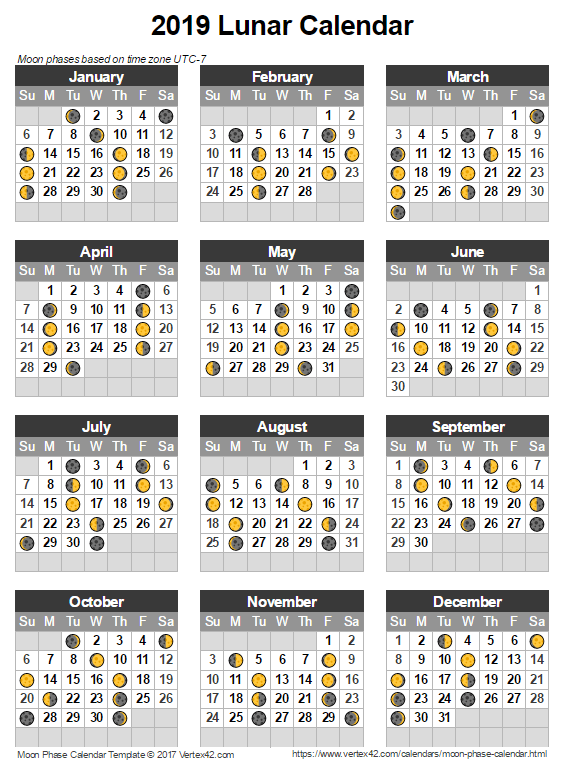 These calendars use the special Unicode characters shown in the table to the right. How these symbols appear on your computer depends on the browser and device you are using, and whether you are using the desktop version of Excel or Excel Online. The templates allow you to choose a year and start month as well as a UTC offset (to show phases based on a specific time zone), but the table of Moon Phases in these spreadsheets currently only includes the years 2017-2030. This version is the same as the Moon phase calendar template above except that it is designed for printing in portrait orientation. *The dates and times for the moon phases listed in these spreadsheets come from the U.S. Naval Observatory website and are listed in UTC time. The templates allow you to choose a UTC offset to display the phases in a time zone closer to you (the default is UTC-7). The exact time of a Moon phase is based on the position of the Moon and Sun relative to the Earth, not the observer's position on Earth. This means that if the time of a Full Moon is listed as "Jan 12, 2017 at 11:34 AM UTC time" only the people on the night side of Earth will see the moon at the time that it is exactly 100% full. People in England on Jan 12, 2017 would not be able to see a 100% Full Moon. The naked eye cannot easily tell the difference between a 95% Full Moon and a 100% Full Moon, so the Moon will appear to be full for about 3 nights. The exact time is not displayed in the calendar, so you may not know whether the phase occurs in the morning or evening, but for most casual uses that won't make much difference. If you need the exact Moon phase times, consult an authoritative website like the U.S. Naval Observatory mentioned above. In these spreadsheets, the times for the waxing crescent, waxing gibbous, waning gibbous, and waning crescent are approximated by calculating the date/time in between the 4 major phases. We felt this was a sufficient approximation for displaying these phases in a calendar. Moon Phases at aa.usno.navy.mil - Authoritative information about the phases of the Moon. Moon FAQ at planetarium.madison.k12.wi.us - A useful FAQ regarding moon phases and time zones.